I don’t know about you, but I love the different kinds of food we associate with each season. We’re heading in to the depths of winter, and I couldn’t be more excited about cozying up in blankets and sweaters with delicious winter food. 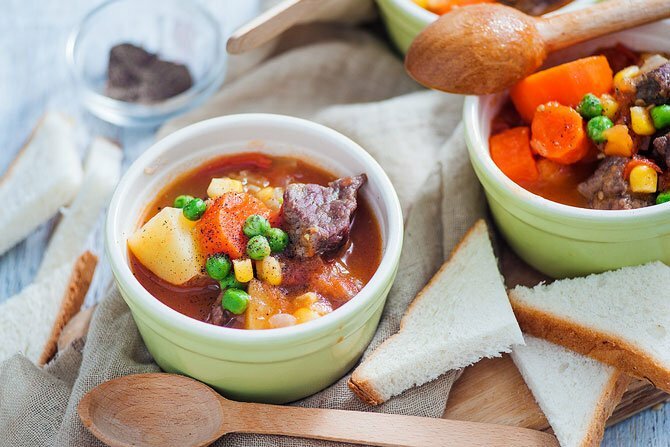 This delicious vegetable and beef soup recipe combines its ingredients with a warming hint of spice. It’s the perfect comforting meal for chilly temperatures. First off, this soup just looks so appealing. 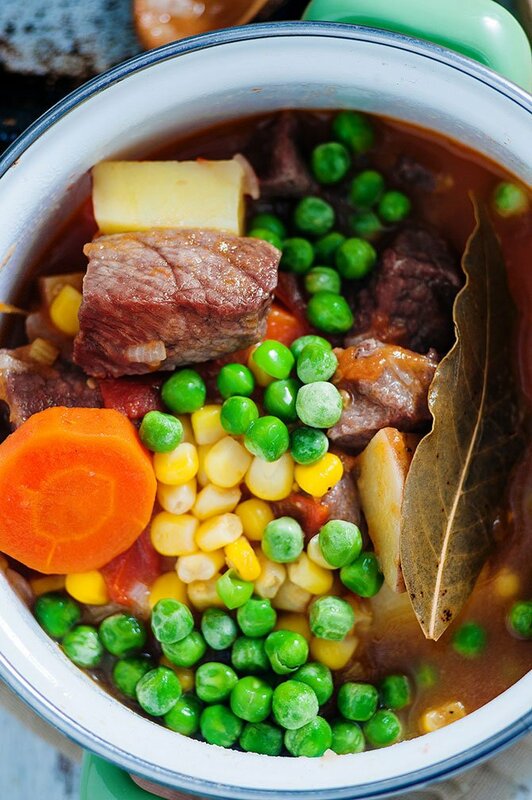 The chunky veggies and hunks of tender beef in this dish will make your mouth water. 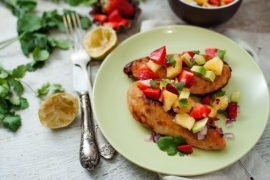 Many of the ingredients are conveniently store cupboard and freezer staples. A lot of the veg is in season or easy to come by too. So thankfully, you won’t be adding ‘sourcing weird and wonderful ingredients’ to your (ever-growing) winter to-do list. The first time I made soup from scratch I was around nine years old. Even with adult supervision, the result was less than impressive. Since then, I’d always been reluctant to try again, instead relying on canned soup. 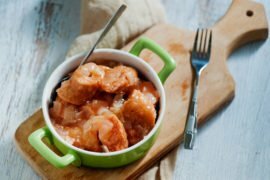 Since finding this recipe, I’m back in the soup-making game! This appetizing and soothing soup has really won me over. One of the things I love about this recipe is the fact that after a bit of prep, you kinda just leave the soup to do its thing for a while. For the small amount of effort it’ll take you to chop and mix a few ingredients, the end reward is wonderful. There’s a great deal of satisfaction in having those delicious, comforting aromas wafting around while this soup gently cooks. The hardest part of this recipe is having the patience to wait before you tuck in! 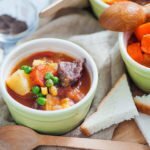 The great thing about this simple yet hearty soup is that you can serve it up on different occasions. It does well as a satisfying family dinner, accompanied by some warm crusty bread. It’s also a great lunch, served from a mug, while you curl up in front of a warm fire and watch the winter weather outside. The wholesome ingredients make for a restoring, soothing meal- ideal at this time of year when so many of our immune systems (and batteries!) are running low. 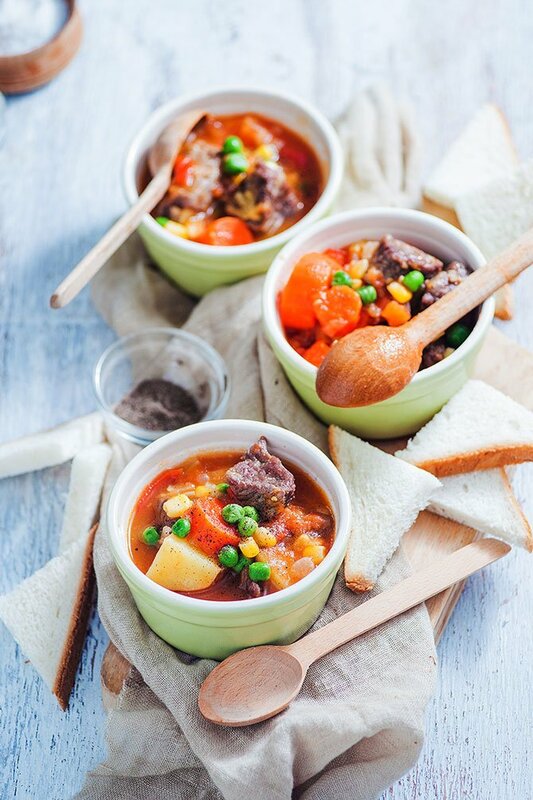 A delicious and warming soup made of chunky vegetables mixed with beautifully tender beef. Add 1 tbsp of oil to a large pot, and warm up on a medium-high heat. Add the beef, and saute until brown all over. Set aside on a plate. In a separate pan, add 1 tsbp of oil and saute celery for 10 minutes, or until onion is golden. Add the cooked beef, tomatoes, potatoes, carrots, corn, water, bay leaves and garlic. Bring to a boil then reduce heat. Simmer uncovered for about an hour, or until beef is almost tender. Add hot sauce and peas, then cover and simmer for 30 further minutes, or until beef is tender.